Members of UCF’s Pegasus Society – high-level donors to the university – were honored Wednesday night at the annual President’s Appreciation Reception at the Morgridge International Reading Center. Society members are recognized for their lifetime giving levels of $1 million or more. Also recognized were generous donors who have given $25,000 or more in the past two years. President John C. Hitt thanked donors for their support, which has helped the university grow its endowment and fund endowed professorships. Endowed positions are crucial for recruiting and retaining the highest-quality faculty. “As members of our Knights family, you have my deepest appreciation for your support in making UCF one of the great success stories in higher education,” he said. Lisa Dieker, Pegasus Professor and Lockheed Martin Eminent Scholar Chair, shared her experiences as a first-generation student who benefitted from scholarship support, and as an endowed professor whose funding has “given me as a faculty member the greatest gift of all: the time to think outside the box.” Dieker demonstrated TeachLivE™, a program created by Dieker and colleagues at UCF, which uses interactive technology and avatars to improve teacher training. In addition, Pamela Carroll, dean of the College of Education and Human Performance (COEHP) and Michael Morsberger, Vice President for Advancement, addressed the group. 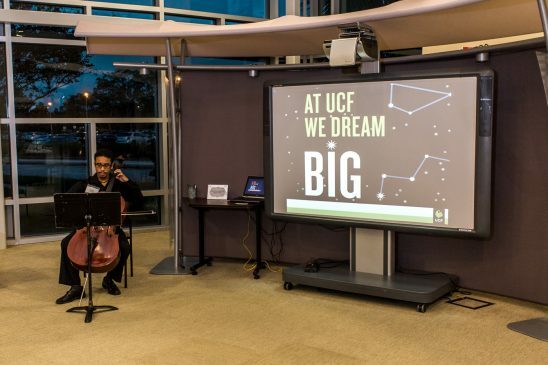 Student musician Aramis Ruiz provided musical entertainment, and College of Education and Human Performance Student Maurice McLeish spoke about his UCF experience.